Zhang, T. and Wang, J. (2016). Shoot Regenerative Capacity Assays in Arabidopsis and Tobacco. Bio-protocol 6(5): e1753. DOI: 10.21769/BioProtoc.1753. Plant regeneration refers to a process through which an explant is differentiated to a whole plant under certain conditions. It has been shown that two plant hormones, auxin and cytokinin, play critical roles within this process (Duclercq et al., 2011). Cytokinin induces shoot regeneration, whereas auxin promotes root production. In addition to hormones, recent study has revealed that age cue serves as a common element behind plant cell totipotency (Toledano et al., 2012). Here we present an easy protocol to assess the shoot regenerative capacity of Arabidopsis and tobacco leaves of different ages. Note: The Pricing and availability are not currently available. To study the molecular basis which age regulates plant regeneration capacity, transgenic tobacco plants with gain of function or loss of function candidate genes were generated by using this method (such as miR156 and its targeted gene SPL9). To get aseptic seedlings, tobacco seeds were sterilized with 15% bleach to shake for 15 min in 2.0 ml tubes. Then wash three times with sterile water. Every seed was germinated on each ½ MS glass bottle. The numbers of aseptic seedlings were determined by the numbers of transgenes. About five aseptic seedlings were needed in each transgene. Seal the glass bottles using surgical tape. Do these in a clean bench. The glass bottles were incubated for 4-5 weeks at 25 °C under long-day conditions (16 h light/8 h dark) (Figure 1A). Cut the aseptic leaves into pieces (about 1 cm in diameter) using scalpel and forceps. Transfer leaf pieces to MS plates and pre-culture them for 2 days at 25 °C under long-day conditions. Do these in a clean bench. The candidate genes were cloned into binary vector (such as pCAMBIA2301) and then were delivered into Agrobacterium tumefaciens EHA105 by the freeze-thaw method (Weigel and Glazebrook, 2006) and cultures were incubated for 3 days at 28 °C. The single positive colony was incubated into 6 ml liquid LB with relevant antibiotics and shook overnight at 28 °C. Transfer 2 ml cultured Agrobacterium to 100 ml fresh LB with relevant antibiotics and grown with shaking overnight at 28 °C. The overnight culture of Agrobacterium was centrifuged for 15 min at 4,000 rpm and resuspended in infection buffer (30 g/L glucose, OD600 = 0.8-1.0). The pre-cultured leaf pieces were transferred into Agrobacterium suspension and infected for 20~30 min. After that, the infected leaf pieces were transferred to MS1 plates and co-cultured for 2 days at 25 °C under long-day conditions. Do these in a clean bench. The infected leaf pieces were transferred to MS2 plate which contained 6-benzylaminopurine (6-BA), a synthetic cytokinin, to induce the formation of shoots. Then explants were cultured for 3-4 weeks at 25 °C under long-day conditions. The regenerated adventitious buds (about 1 cm size) on each leaf pieces were isolated by scalpel and forceps (Figure 1B), transferred to a glass culture bottle with MS3 media and cultured for 3-4 weeks. Figure 1. Construct the transgenic plants in tobacco by the tissues cultures. A. A tobacco plant grown in glass bottle for 4-5 weeks, bar = 1 cm. B. The regenerated adventitious buds on an explant, bar = 100 μm. C. A regenerated plant which has been cultured 3-4 weeks on MS3 plate, bar = 1 cm. Subculture once with MS3 media, when the adventitious buds grew up into whole plants. Finally, transfer regenerated plants from MS3 plates to soil and grow them in growth chamber at 25 °C under long-day conditions. To study the relationship between the shoot regenerative capacity and plant age, regeneration assays were performed using the ﬁrst/second (early), ﬁfth (mid), and ninth/tenth (late) tobacco leaves as explants. Tobacco seeds were grow on soil in a growth chamber under long-day conditions. The ﬁrst/second (early), ﬁfth (mid), and ninth/tenth (late) tobacco leaves were collected and placed on deionized water. To avoid the impact of leaf development on regenerative capacity, the leaves of the same size (1 cm in length) were used. Detached leaves were sterilized with 10% bleach for 15 min in sterile Petri dishes. Wash three times with sterile water. Punch on leaves. The leaf dices without vascular tissue (5-mm in diameter) were used as explant. Transfer explants to MS media with 6-BA of different concentrations (such as: 0.05 mg/L, 0.2 mg/L, and 0.5 mg/L). Explants were cultured at 25 °C in an incubator under long-day conditions. After about 3-4 weeks, the regenerated shoots appeared. The numbers of explants and regenerated shoots were scored (Figure 2). The regenerative capacity was represented by the number of regenerated shoots in the number of explants. Figure 2. Count the regenerated shoots and evaluate the shoot regeneration capacity of explants in tobacco. A. Explants were cultured on MS plates for 3-4 weeks, n = 3 x 9, bar = 0.5 cm. B. The regenerated shoots from explants which were cultured on the MS media with 6-BA, n = 3 x 9, bar = 0.5 cm. C. Shoots that was scored like this, bar = 100 μm. D. One example of representative data on tobacco. In Arabidopsis, shoot regeneration requires two steps. 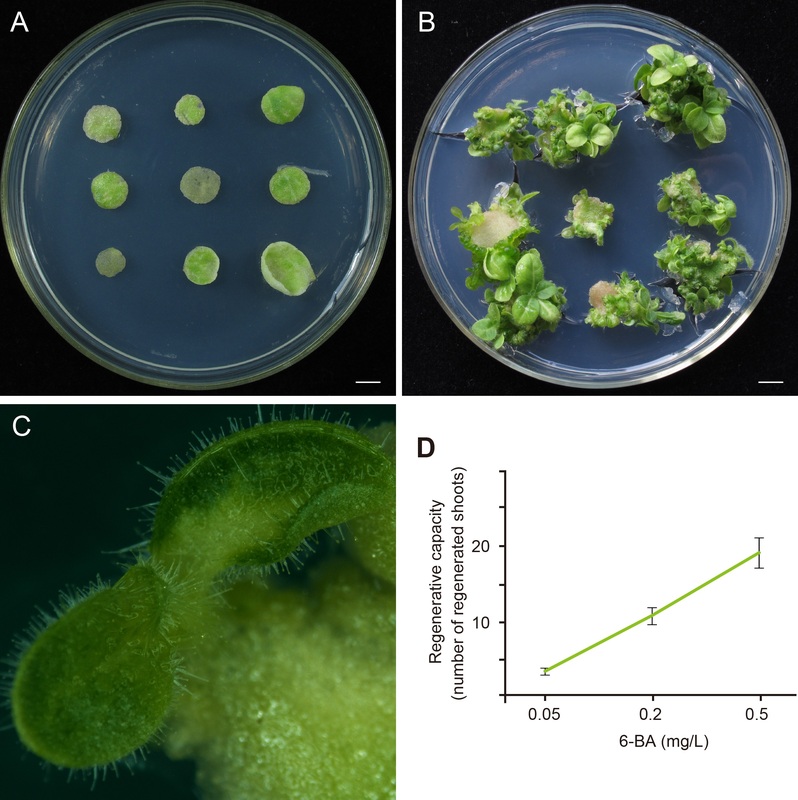 First, explants were cultured on an auxin-rich callus-inducing medium so that they acquired competence to form shoots. Second, the callus were induced to produce shoots on a shoot-induction medium (Valvekens et al., 1988). Arabidopsis seeds were sterilized with 15% bleach for 15 min and kept at 4 °C for 2 days under darkness. The seeds were sowed on 1/2 MS plate and incubated at 22 °C for 7 days under darkness. The hypocotyls (1 cm in length) were cut out and used as explants for regeneration assays. The hypocotyl segments were transferred to auxin-rich callus-inducing medium (CIM) and cultured for 7 days 22 °C in an incubator under long-day conditions (16 h light/8 h dark) (Figure 3A). The calli were then transferred to shoot-inducing medium (SIM) with 2-IP of different concentrations. The shoots will be regenerated by culturing calli at 22 °C under long-day conditions (Figure 3B). The number of regenerated shoots was scored. The regenerative capacity was represented by the number of regenerated shoots in number of explants. Figure 3. The regeneration assays to measure the shoot regeneration capacity of explants in Arabidopsis. A. Arabidopsis hypocotyls were cultured on an auxin-rich callus-inducing medium for 7 days, n = 3 x 10, bar = 1.0 cm. B. The regenerated shoots on shoot-induction medium, n = 3 x 8, bar = 1.0 cm. C. Shoots that was scored like this, bar = 1.0 cm. D. One example of representative data on Arabidopsis. The work in the Wang laboratory is supported by grants from the National Natural Science Foundation of China (31430013; 31222029; 912173023), the State Key Basic Research Program of China (2013CB127000), the Shanghai Outstanding Academic Leader Program (15XD1504100) and the NKLPMG Key Research Program. This protocol was adapted from our recent publications (Zhang et al., 2015a; Zhang et al., 2015b). Duclercq, J., Sangwan-Norreel, B., Catterou, M. and Sangwan, R. S. (2011). De novo shoot organogenesis: from art to science. Trends Plant Sci 16(11): 597-606. Toledano, H., D'Alterio, C., Czech, B., Levine, E. and Jones, D. L. (2012). The let-7-Imp axis regulates ageing of the Drosophila testis stem-cell niche. Nature 485(7400): 605-610. Valvekens, D., Van Montagu, M. and Van Lijsebettens, M. (1988). Agrobacterium tumefaciens-mediated transformation of Arabidopsis thaliana root explants by using kanamycin selection. Proc Natl Acad Sci U S A 85(15): 5536-5540. Weigel, D. and Glazebrook, J. (2006). 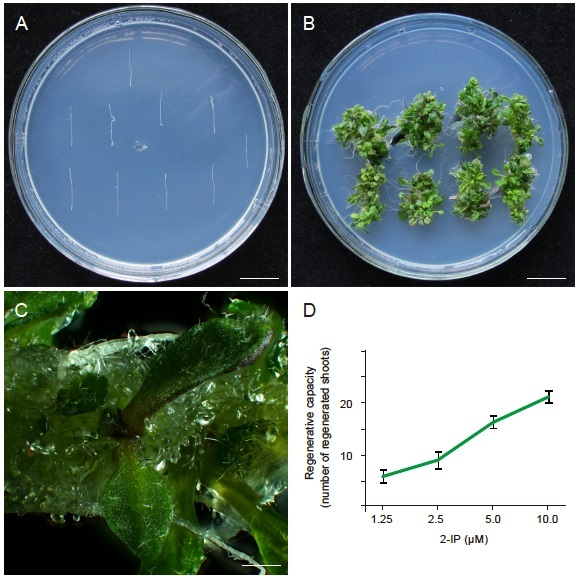 Transformation of agrobacterium using the freeze-thaw method. CSH Protoc 2006(7). Zhang, T., Wang, J. and Zhou, C. (2015a). The role of miR156 in developmental transitions in Nicotiana tabacum. Sci China Life Sci 58(3): 253-260. Zhang, T. Q., Lian, H., Tang, H., Dolezal, K., Zhou, C. M., Yu, S., Chen, J. H., Chen, Q., Liu, H., Ljung, K. and Wang, J. W. (2015b). An intrinsic microRNA timer regulates progressive decline in shoot regenerative capacity in plants. Plant Cell 27(2): 349-360. How to cite: Zhang, T. and Wang, J. (2016). Shoot Regenerative Capacity Assays in Arabidopsis and Tobacco. Bio-protocol 6(5): e1753. DOI: 10.21769/BioProtoc.1753.